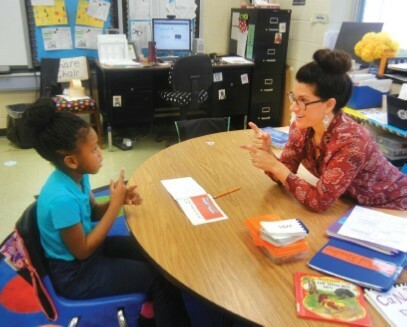 Kindergarten teacher Nicole Williamson teaches a guided reading lesson in a one-on-one situation. The decision to adopt the Fairview Learning program at the Eastern North Carolina School for the Deaf (ENCSD) can be traced back to a brief conversation between Laurie Rook, ENCSD lead teacher, and Dave Dolman, coordinator at the Education of the Deaf and Hard of Hearing Program at nearby Barton College. Dr. Dolman shared an article about the program and Laurie Rook took the idea back to some of ENCSD’s teachers and leadership team. A virtual meeting was set up with Trish Vierra, Fairview Owner and CEO. Everyone liked what they learned and administration gave the go ahead to set up training. Trish Vierra came to ENCSD for a two-day training in August, 2015 and follow up virtual sessions were staggered throughout the 2015-16 school year. During the second year of implementation, ENCSD continued with virtual sessions as well as videotaping of lessons. Those lessons were sent in through GoReact and our teachers/reading tutors received feedback from one of the reading tutors at the Utah School for the Deaf Reading Clinic. The feedback was shared with all staff using the Fairview program to maintain consistency and ensure lessons were taught effectively. One of the most valuable opportunities ENCSD had was to visit the Reading Clinic in Salt Lake City, Utah and actually see the Fairview program in action. All of our training we received on the “how to” of the program was very beneficial. But having the opportunity to observe Trish Vierra teaching the lessons and being able to ask questions proved to validate what ENCSD already put in place, correct any of our misconceptions, and to continue our program with fidelity. 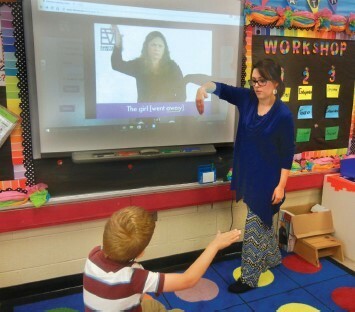 Using the online component to Fairview Learning, elementary teacher Chelsea Cashion teaches the Bridge Phrase went away.